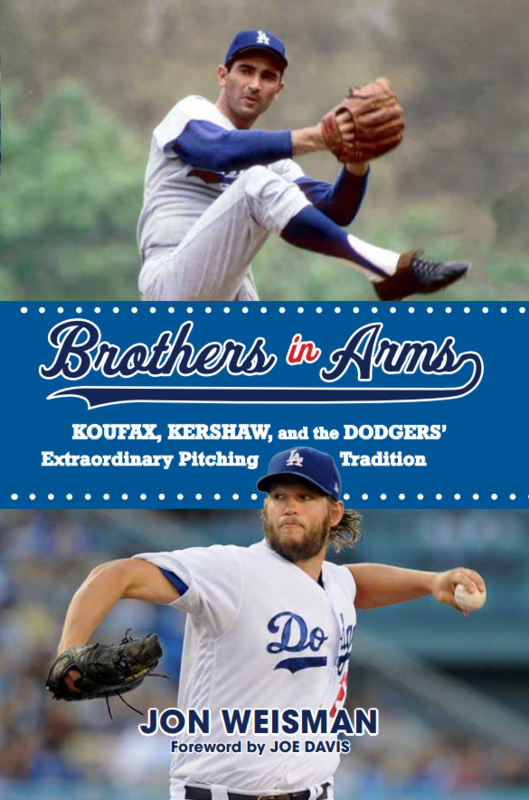 In this week’s preview teasing the May 1 release of Brothers in Arms: Koufax, Kershaw, and the Dodgers’ Extraordinary Pitching Tradition (pre-order now! ), we come to two pitchers that you’ve heard a little bit about and then some: Sandy Koufax and Don Drysdale. It’s possible that more words have been written about those two than any other hurlers in Dodger history. So what could Brothers in Arms possibly offer? In the case of Koufax, the approach is two-fold. I wanted truly to capture, using a number of different sources, the process by which the lefty became the supreme being (I don’t use that term lightly) of the Dodger pitching tradition. But at the same time and perhaps more importantly, to show how Koufax himself didn’t think himself above the game. During the 1965–66 off-season, before his retirement was announced but certainly with the knowledge that it was coming, Koufax worked with sportswriter Ed Linn to produce his autobiography. While the spine of the book was a chronological recap of his life and baseball career, its prime objective can be found in the opening chapter. Humor aside, Koufax’s passion for pitching cannot be stressed enough. “What offends me about the myth, aside from its sheer falsehood, is that it makes me sound as if I feel I’m above what I’m doing, which is an insult not to me but to all ballplayers,” he said. “I like what I’m doing. I find that pitching, both as an art and a craft, is endlessly demanding and endlessly fascinating. In contrast, no one has ever doubted Drysdale’s passion for baseball, so the goal was just to dig deeper and deeper into what made him the pitcher and person he was, leading into the sad poignancy of his all-too-soon passing. A fun moment in the chapter is reading how Drysdale was influenced early in his career by Sal Maglie, the longtime Giant who ended up making an outsized impact late in his career as a Dodger. Frankly, the approach was more cerebral than hostile, centered on manipulation as opposed to intimidation. Maglie showed Drysdale how he would waste a pitch outside, not necessarily to get a batter to chase but to see how the batter reacted with his feet and what that revealed about his expectations. 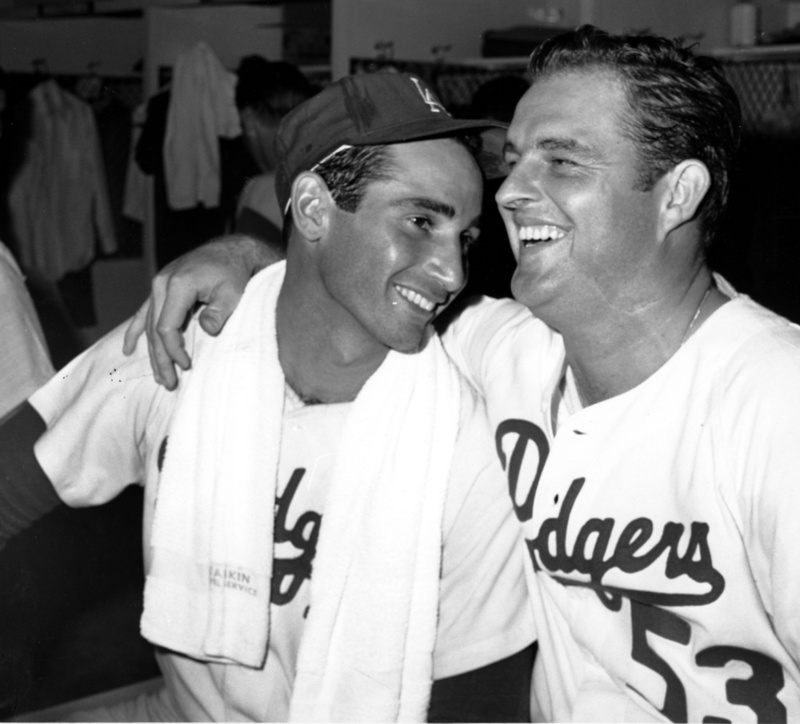 There are tons more need-to-know, fun-to-know info on Koufax and Drysdale in Brothers in Arms. Trust me, you’ll want to have it handy.